Pain is a signal sent to our awareness when something is wrong. Injurious events are picked up by our nerve endings and send to relay stations in the brain where they are interpreted for reaction. Sometimes pain is referred from another muscle or organ some distance from the pain. Expertise is required to resolve the cause of the pain…not just the symptoms. Pain has many dimensions. From a strictly physiological (ie: body-functioning) or sensory perspective, practitioners are interested in the location, onset, intensity, quality and pattern of the pain. We also want to know the affective impact on how pain affects your mood – does it cause anxiety or depression? How does it affect your well-being? Your perception of pain is influenced by your cognitive processes: what does pain mean to you? What are your attitudes and beliefs about yourself and about pain…is pain a punishment, or simply a signal of something off-line? What are your coping skills and strategies in dealing with pain? What has been your experience in receiving treatment for your pain? For some people their pain is made worse by behaviours they themselves are generating. Using words and language that communicate a lost sense of control or victimization, or the opposite of not expressing painful feelings can repress those feelings and lead to physical pain. Being fearful or apprehensive due to the fear of pain, limiting physical activity causing a deconditioned body, not getting sufficient sleep/rest or using medications excessively can impair our ability to deal with pain. Your pain perception is also influenced by your socio- and ethno-cultural background. Do you have family members relying on you? Does pain affect your ability to function in your work, your social situations or recreational pursuits? Is the display of pain rewarded or inhibited in your culture or family of origin? “Pain is probably the single most common symptom experienced by humans and, along with fatigue, is the most frequent reason for anyone consulting a doctor in industrialized societies – indeed the World Health Organization (1981) has suggested that pain is ‘the primary problem’ for developed countries. It’s actually not stress that causes us harm…it’s our response to it. In Dr. Robert Sapolsky’s book Zebras Don’t Get Ulcers, he describes most mammals are designed for “3 minutes of screaming terror” as they are pursued by a predator, or chasing prey as the desperately hungry predator themselves. The stress response liberates available energy and delivers it along with blood and oxygen to the brain and muscles, shuts down long-term projects (growth, digestion, reproduction), boosts clotting factor and blunts pain sensation (anticipating injury) and focuses the mind for learning and recall. Our survival depends on the stress response. “After the 3 minutes of screaming terror,” Sapolsky summarizes “it’s over…or it’s over for you”. Short-term stress as described above we can handle…it’s the chronic stress that kills us. Humans anticipate threat — real or perceived — in the deadline, the obligation or upcoming event we’re regretting, fear of failure or success, worried we will be disappointed or rejected. We can generate chronic stress through our own imaginings which, as Sapolsky puts it, lead to “anxiety, neurosis, hostility and paranoia”. Of illness, Sapolsky says “Stress is not a causative factor, stress is an exacerbative factor. It makes pre-existing disease worse”. This is an important distinction – the chronic stress response becomes more damaging than the stressor itself! Zebras don’t get ulcers because they don’t worry themselves over whether a threat will come along. They handle it as it arises. Humans however worry constantly, and their chronic stress response does them more harm than the stressor itself. Once stimulated by ACTH, the adrenal cortex acts like an endocrine gland and releases corticoid hormones, including the oft-referenced cortisol. Cortisol acts on almost every tissue in the body and is key in the body’s response to stress, dampening the body’s stress reaction and, consequently, the immune system. Cortisol has an ulcerating effect on the intestines and a thinning effect on bone tissue. The alarm response, in addition to the taxation on the hormone, immune and intestinal systems, affects the heart, lungs, skeletal muscle and emotional centres. The hypothalamus maintains two-way communication with the brain centres that process emotion; therefore, it is via the HPA axis that emotions exert their influence on the immune system. In his book When the Body Says No, author and Vancouver physician Gabor Maté states, “Stress is a complicated cascade of physical and biochemical responses to powerful emotional stimuli.” He elaborates: “Disease is disharmony. More accurately, it is an expression of an internal disharmony.” The new science of psycho-neuro-immunology (PNI) draws the relationship of distant and sometimes unconscious repressed feelings to physiological manifestations of disease. Medical texts maintain a biological cause of illness, despite extensive research implicating emotions in the causation of many diseases. Maté draws a correlation between the ravages of prolonged stress response due to the inability to effectively express emotions, and serious illnesses such as scleroderma, SLE (systemic lupus erythematosus), multiple sclerosis, ALS (Lou Gehrig’s disease), cancer, breast cancer, Alzheimer’s disease, and irritable bowel syndrome. Borrowing from Hans Selye’s research, Maté outlines the stress response. Stress contains three elements: the stressor, interpretation of the stressor by the organism and the response. In lab studies with rats exposed to stress, Selye found enlarged adrenals, shrunken lymph organs and ulcerated intestines. The literature identifies stress facilitated by feelings of: i) uncertainty; ii) lack of information; and iii) loss of control. 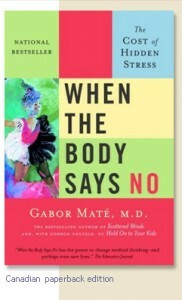 Maté describes common beliefs shared in people with chronic illness, such as “It’s not right for me to be angry,” “If I’m angry, I will not be loved,” “I’m responsible for the whole world,” and “I must justify my existence/I must do something.” He describes the development of “emotional competence,” which outlines the capacity to identify feelings, the ability and opportunity to express them, the facility to distinguish (current from past) and the awareness of the genuine need to address emotions to one’s satisfaction. You can interrupt the cascade of harmful chronic stress reactions with self-awareness techniques such as controlled breathing and meditation or prayer, taking a physical break and using various cognitive techniques to monitor your thoughts and feelings. When stress is insidious and overwhelming, stronger interventions like psychotherapy, prescription drugs and body awareness therapies may be prescribed. Massage therapy can be very helpful in ameliorating the physical effects of chronic stress response, and is even helpful psychologically. Moore et (2002) found people treated with massage therapy showed a decrease in trait anxiety and subclinical depression while Diego et al (2001) hypothesized massage therapy promotes parasympathetic activity in the body – reducing stress hormone levels and promoting feelings of calmness and well-being. Field et al (1996) studied the effects massage therapy had on office workers and noted an alleviation of anxiety and improvement in mental alertness. Registered massage therapists are trained and well-educated to understand the impact of chronic stress, and provide remedy for stress’s ravaging effects.